“Elder Rage” is a Book-on-the-Month Club selection (a caregiving book first), receiving 500+ 5-Star Amazon reviews. It is a riveting, often LOL humorous, non-fiction novel chronicling Jacqueline Marcell’s trials, tribulations, and eventual success at managing the care of her aging parents. “Elder Rage” is also an extensive self-help book with creative solutions for effective management medically, behaviorally, socially, legally, financially, and emotionally of challenging elders who resist care. 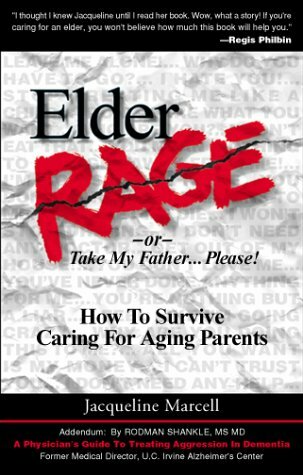 “Elder Rage” includes answers to difficult caregiving questions such as how to get obstinate elders to: accept cleaning and caregiving help, see a different doctor, give up driving, attend adult day care, eat, take medication, sleep and bathe properly, move to a new residence, and much more. Also an extensive Q&A section, valuable resources and recommended reading. The extensive addendum by renowned neurologist/dementia specialist, Rodman Shankle, MS MD: A Physician’s Guide to Treating Dementia, helped make “Elder Rage” required reading at numerous universities for courses in geriatric assessment and management. It is also considered for a film. The final key was getting herself into a support group and getting her parents out of bed (“waiting to die”) and enrolled in physical and emotional therapies at an Adult Day Health Care, which completely turned their lives around at 80 and 85. Marcell adds, “75% of dementia patients are cared for at home and sadly elder abuse is rising dramatically because families are unprepared for the frustrations. She believes that with education and the use of Adult Day Care, elder abuse can be reduced. The National Center on Elder Abuse published a very favorable review of Elder Rage in their national newsletter. Marcell emphasizes, “Dementia costs American business multi-billions of dollars a year–largely due to lost productivity from absenteeism of employees who must take time off to care for ailing loved ones. Everyone should know the ten early warning signs of Alzheimer’s and the importance of getting the right help sooner than later.” Marcell says she learned caregiving the hard way which is why she wrote her first book, “so that no one would ever have to go through what I did.” Determined to make a difference, Marcell says her ultimate goal is to help change our eldercare laws.” She laughs, “I have an ulterior motive–I don’t have children, so I’ve got to help straighten things out before I get there!